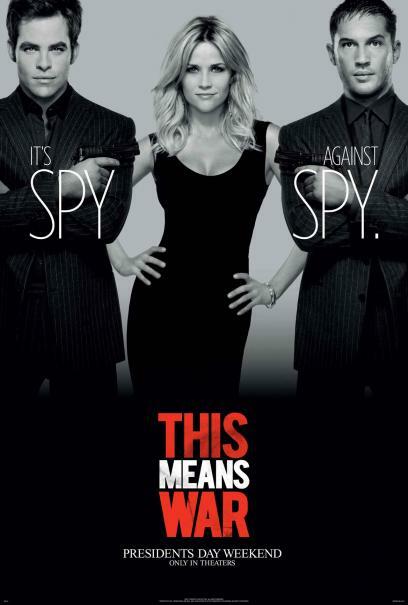 Two friends, who also happen to be top CIA operatives, wage battle against each other after discovering they’re dating the same woman (played by Reese Witherspoon, Walk the Line, Election, Legally Blonde). Sounds like light fare that’s slick Hollywood, and it is, but it also has some entertaining bits. This is largely due to Witherspoon. She manages to walk the line between being fortunate enough to date two handsome men and also appear sympathetic to the audience as she embarks on the lonely and disheartening game of dating, which doesn’t come naturally to her. That said, this film is not worth the price of a cinema ticket, even as it is worth renting on DVD because it’s easy and pretty. The subplot about a “bad guy” out to get the two CIA operatives as revenge, is gratuitous and concludes abruptly. The romance between the three primary characters is too expedient and easy, as are their feelings of love. The comic relief of the film, Witherspoon’s bawdy confidante, is overdone, though she has her moments. And one can’t help but wonder how these two men became so powerful within their organisation when they are so indiscreet and blatantly misuse their company’s resources. Ultimately, this film has explosions, the smashing up of things, romance, and gorgeous clothes and shoes, suggesting that the filmmakers created a script based on the assumptions about what men and woman want in a movie. They almost got it right in terms of the acting and the concept, but they couldn’t hide the fact that the plot is thin, the circumstances and events too unbelievable (even for those most ‘game’ for it in the audience), and the dialogue is often too embarrassing to listen to, much less funny. I liked the film a lot and laughed myself silly in places. Guess I’m really dense, huh? I like Tom Hardy since seeing him in “Bronson” a few years back. What he’s doing in this film is beyond my comprehension however. Reese and the other guy I can understand…but Tom Hardy? It sickens me that very few actors nowadays care about their resume. Tom Hardy has a great one. Now with this piece of idiocy I wonder if he’s the actor I assumed him to be…smart and careful with his career. This was always only ever going to be a piece of fluff, or worse…and it begins with an S and ends with a T. So now it’s on his resume and all I can think is that he’s a weak dipsh&t of an actor who listened to his agent and took this “High Profile” film…or he’s after money…or he doesn’t care about doing good work and just wants to be a big star. The bottom line for me is that this film has ruined absolutely any good thoughts I had towards Tom Hardy. Reese and the other guy…already Hollywood flotsam and jetsam playing the game, but I thought Hardy as better. He’s not. After this and The Dark Knight Rises..watch out Hollywood because you’ve just gotten your next big Movie star…ZZZZZZ. Not Actor…but Star. After this his roles will become less interesting and he’ll wonder why. It’s because of decisions like doing this pice of crap. Thank you for reading the review and your comment. Fair enough, Miss Jelinek. I agree that Hollywood does help out the independent system from time to time, and you’re spot on about her performance in “Election”…though I wasn’t too impressed with what she did in “Walk the Line”. It was not a difficult performance and since she was blessed with a decent voice as it was, I didn’t think her winning was anything special. And I’m sorry but while I don’t have any respect for the Oscars, it’s still hard for me to say that Reese Witherspoon is an Academy Award Winning Actress. Anywho…she was very good in “Man on the Moon” or something like that years and years ago. But I digress. This film was a pathetic attempt on her part – her being a part of the Hollywood system for sure – to be relevant again. But to most hollywood actors that means being in a hit…not working with a great director or doing a tough film…like Kirsten Dunst in Melancholia. Let’s face it…if Reese Witherspoon was a true actress, she could call up any edgy, talented, world famous world cinema director and say…”I’d like to work with you.” Instead she bombs in that James L, Brooks piece of crap – Paul Rudd has overstayed his welcome – where she was the object of TWO guys affections and what does she do next but this film…where again she’s the object of two guys affections. Sorry, Reese. No is buying you as the object of ANYONE’S affections…and so let’s see where your career goes next. As I said…if someone is a pure actor or actress and they’re famous – lord knows they have enough money for this and the next lifetime – then they should seek out interesting projects. Miss Witherspoon bores me. I don’t seek out her films.